Picture a Day - The Holy Land Revealed: Re-posting: Celebrating July 4th in the Holy Land 100 Years Ago. A Comic Troupe of Troops? Re-posting: Celebrating July 4th in the Holy Land 100 Years Ago. A Comic Troupe of Troops? The founders of the American Colony in Jerusalem in 1881 were proud of their American roots. The group of utopian, millennialist Christians were later joined by Swedish-American and Swedish believers. The American Colony set up clinics, orphanages, cottage industries and soup kitchens for the poor of Jerusalem, earning favor with the Turkish rulers of Palestine. 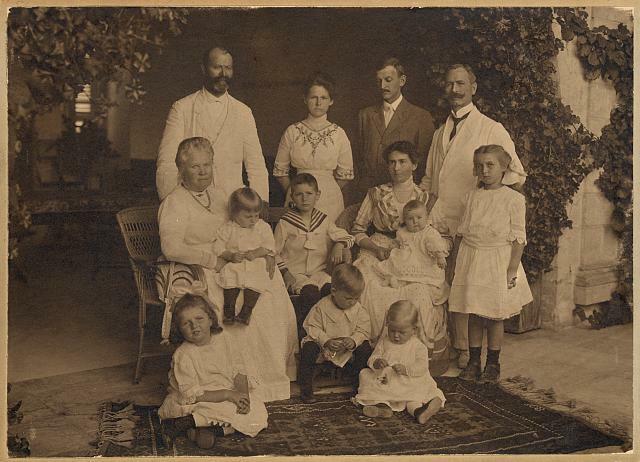 Their concern for all citizens of Jerusalem was evident in the shelter and assistance they provided to destitute Yemenite Jews who arrived in Jerusalem in 1882. When World War I broke out, the American Colony's photographers were able to work on both sides of the conflict. At the start of World War I and before the United States joined in the war effort, American aid to the Jews of Palestine was crucial for their survival. In October 1914, the U.S. Navy's North Carolina delivered $50,000 for the Jews' relief. In some cases the funds were administered through the American consul general in Jerusalem so that the money would not be confiscated by Turkish authorities. The British army, under General Edmund Allenby, captured Jerusalem in December 1917. Seven months later, in 1918, Allenby was the guest of honor at the American Colony's July 4th celebrations. Click on the captions to see the original. Does R.E. stand for Royal Engineers? The battle for Palestine in World War I was a long and bloody campaign pitting Turkish, German, and Austrian troops against the forces of Britain, India, Australia and New Zealand. The war, fought with infantry, cavalry, artillery, planes and tanks, was waged from the Suez Canal to Damascus. A special effort was made by the British commander, Gen. Edmund Allenby, to capture Jerusalem by Christmas 1917. 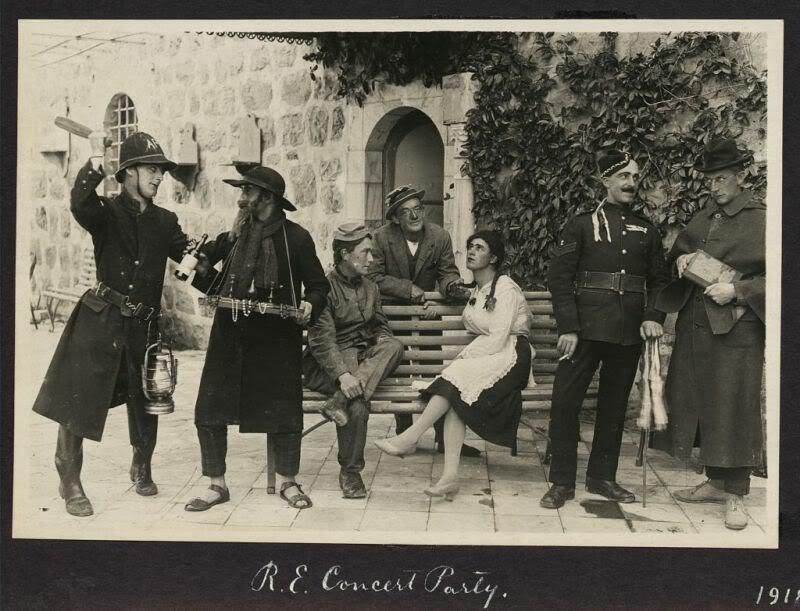 This curious photograph appears in a photo album assembled by the American Colony photographers, apparently taken at a Jerusalem party hosted by the Colony on July 4, 1918. Allenby was in attendance. The caption, "R.E. Concert Party" almost certainly identifies the characters as soldiers of the Royal Engineers of the British army. The actors are part of the British army's theater and concert group, known as a "concert party" or a "Pierrot troupe" that entertained the troops during the war. 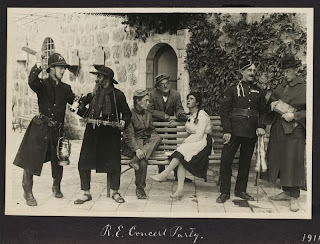 The woman is a female impersonator, and the figure second from the left appears to be an actor portraying a Faginesque Jew with a long beard and sidecurls, black hat, bottle of wine and candlesticks. For more history on the "concert party" during World War I see the Australian War Memorial Research Centre. Amazing that those shots are still pretty crisp considering they are decades old. It actually makes me wonder a bit how they would've turned out if Digital Cameras existed back then.